Receiving income from various sources. Income is obtained from multiple sources including individual donors, companies, foundations, the Dutch Postcode Lottery, institutional donors and government bodies. Generating income for multiple, diverse sources, reduces the risk of a sudden decrease in income. Ensuring the availability of flexible income in addition to earmarked income. War Child seeks a prudent balance in earmarked and non-earmarked income. Earmarked funds have to be spent in a specific country or project, but the availability of sufficient non-earmarked funds, allows War Child to adapt quickly to changes at the country or head office level. Maintaining an appropriate continuity reserve. War Child’s continuity reserve complies with VFI regulations and is reviewed and approved annually by the Supervisory Board using stress tests simulating crisis situations. The reserve is adequate to ensure continuity even if sources of income are lost or unforeseen expenses must be covered. Receiving structural income. Structural private donors donate via direct debit on a regular basis, while corporate donors commit to War Child through multi-year contracts. Some institutional grants are also for longer terms, such as the MFS II grant, which guaranteed funding over a five-year period (2011-2015). In this way, a proportion of War Child’s income is safeguarded over a longer period, supplemented by fluctuating short-term grants and one-off donations. Strict and cautious treasury management. 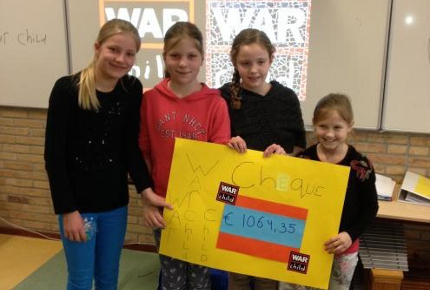 All of War Child’s income is deposited in accounts with reputable banks. Funds deposited in instable project countries are kept at the minimum level required to cover local working capital needs. War Child does not invest any of its income, believing that it is inappropriate to speculate using funds donated by third parties.